Can occur to some extent in all apple growing regions but is especially a problem where temperatures are high and skies are clear. Found more frequently on fruit on the southwest quadrant of the tree. Heavy crops that cause branches to bend over mid-season can increase sunburn incidence as a sudden exposure to heat and sun promotes sunburn development. Water stress can increase the incidence of sunburn. Granny Smith and other light skinned apple varieties are more sensitive to sunburn. Also, sensitivity may be associated with low calcium concentration in the fruit. 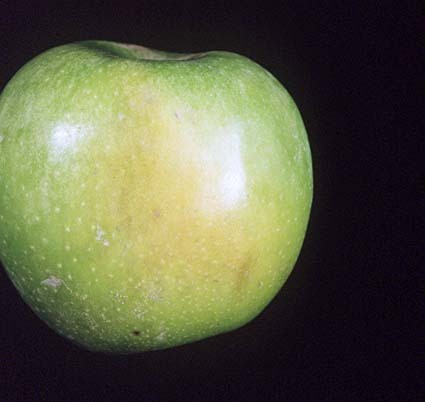 Initial symptoms are white, tan or yellowed patches found on the sun exposed side of the fruit. With severe skin damage, injured areas can turn dark brown on the tree. White, tan or yellow patches often turn brown within a few weeks in cold storage (sometimes called sunburn scald but not controlled by antioxidants, such as diphenylamine, as is storage scald). During unusually hot weather following cool or moderate conditions, and especially when accompanied by water stress, injury to the skin and flesh can occur. Injured cortex tissue is brown and firm and may become spongy and sunken. Fruit exposed to the sun after removal from the tree, either on the orchard floor or in field bins, can develop severe sunburn. Sunburn results from heat stress to the fruit leading to injury of the affected cells. The temperature of the surface of the fruit can be as much as 18°C (32°F) above air temperatures when the fruit is exposed to solar radiation and 8 to 9°C (14 to 16°F) warmer than the shaded side of the fruit. The transpiration or evaporation of water from the apple fruit helps to cool the fruit while it is attached to the tree. Upon harvest from the tree or during periods of water stress on the tree, fruit surfaces and flesh can increase to much higher temperatures resulting in greater sunburn. The greatest problem occurs when fruit are suddenly exposed to high temperatures and intense sunlight such as when the weather rapidly shifts from being cloudy and cool for many days to sunny and warm. The shifting of branches during the season due to heavy fruit loads can suddenly expose fruit to the sun as can harvesting fruit into field bins which are left in the sun. A gradual increase in temperature and solar radiation could allow the fruit to adapt whereas a sudden change does not allow for adaptation and often results in injury. The best method of control is to avoid sudden exposure of fruit to intense heat and solar radiation. Proper tree training and pruning are critical. Summer pruning must be carefully accomplished to avoid excessive sunburn. Overhead sprinkling and white washing of trees have both been tested with mixed success in reducing sunburn. While some reports indicate that overhead sprinkling reduces sunburn, the potential benefit must be weighed with potential increases in apple scab and fireblight. White washing showed no benefits in tests in California. Avoid water stress in cropped orchard trees to reduce heat stress. Once injury has occurred, there is no treatment to prevent browning in storage. The browning which occurs in storage as a result of sunburn cannot be prevented with diphenylamine (DPA) drenches. Careful sorting to remove affected fruit upon packing is the only solution once the injury has occurred. Injury will be easier to spot after a few weeks of storage because of the change in color from yellow to brown. Postharvest Disorders of Horticultural Products Vol. I: Temperate Fruit. Beattie, B. B., McGlasson, W. B., and Wade, N. L., (eds.). CSIRO Publications, Melbourne, Australia, ISBN 0-643-05051-5.